Description: First floor interior of the Wichita City Library located at 220 South Main. Keywords: Libraries and museums, people. 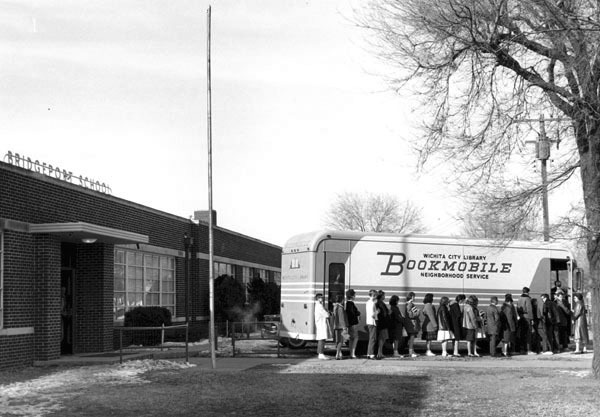 Description: Wichita City Library Bookmobile at Bridgeport Elementary School, 3601 North St. Francis. Keywords: Libraries and museums, children, education. Description: Children's story telling at the Wichita City Library, 220 South Main. Frances Sullivan, is the children's librarian reading the book. 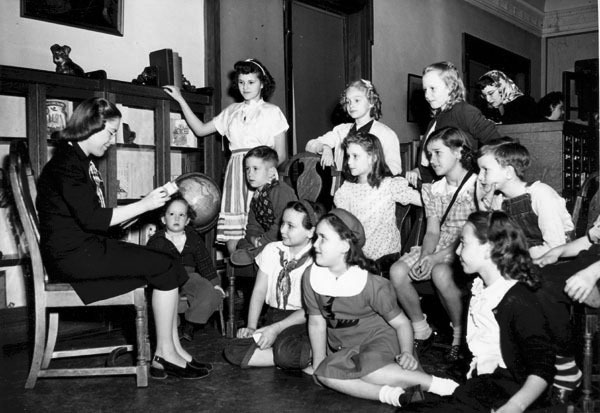 On the front row one girl is dressed in a Brownie uniform and another girl in a Camp Fire Girls uniform. Keywords: Libraries and museums, children, people. Description: View looking northwest at intersection of Water and English Streets. The Forum operated as Wichita’s primary auditorium, convention center, performance arena, and exposition hall from 1912 to 1965. The small sign on the front canopy indicates the Wichita Public Museum. 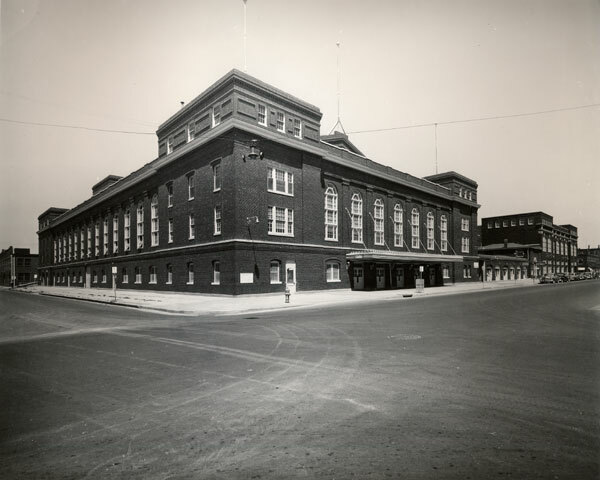 The museum was housed on the second floor of the Forum from 1939 until it moved to a grand residential structure at 3751 East Douglas Avenue in 1956. Keywords: Arts and entertainment, libraries and museums, public events, street scenes, transportation, Wichita, automobiles, architecture. Description: Aerial view looking northwest toward bend in Big Arkansas River west of the Seneca Street bridge. Roadway along left bank is McLean Boulevard. West Side Athletic Field park is at left; Sim Park Golf Course, at top center; and Old Cowtown Museum grounds on north bank. Photograph taken in September 1954. Keywords: Wichita, aerials, libraries and museums, sports and recreation, street scenes, rivers. Description: Original Wichita Art Museum building built in 1934. Designed by Clarence Stein and constructed with Public Works Administration funds. Sculpture in foreground, "Tree" by Wichita artist David E. Bernard, was commissioned by Wichita Campfire Girls for group's 50th anniversary. Keywords: Wichita, libraries and museums, buildings. 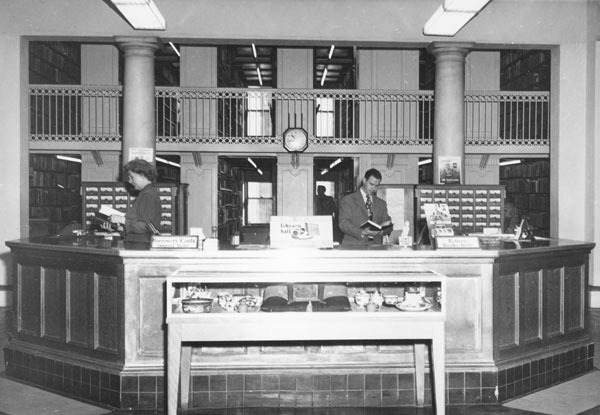 Description: Interior of Wichita City Library, located at 220 South Main. The two women on the left at the desk are librarians Jeannette Karr and Gertrude Jewell. Keywords: Libraries and museums, people, fashion. 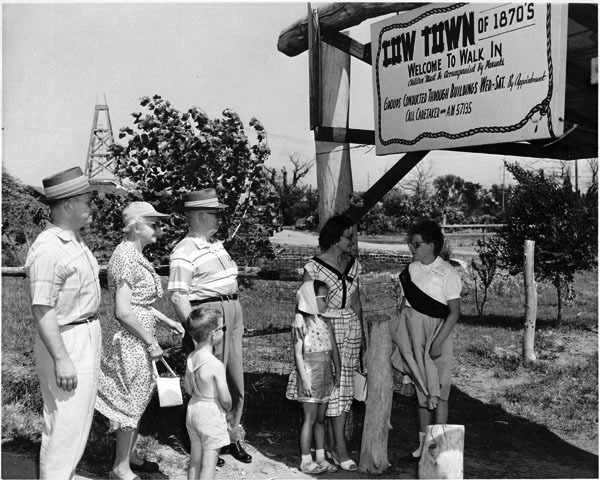 Description: Girl Scout greets visitors at entrance to Cowtown museum. Keywords: Wichita; libraries and museums; arts and entertainment; people; organizations, clubs and groups. Description: In costumes reflecting Kansas' centennial year, unidentified group poses in Wichita City Library in front of large sign urging "yes" vote on bond issues for new library and auditorium. On May 23, 1961, Wichitans voted to build the new structures. Keywords: Wichita; libraries and museums; people; organizations, clubs and groups. Description: The Volunteer Book Brigade transferring books to the new Wichita City Library at 223 South Main. 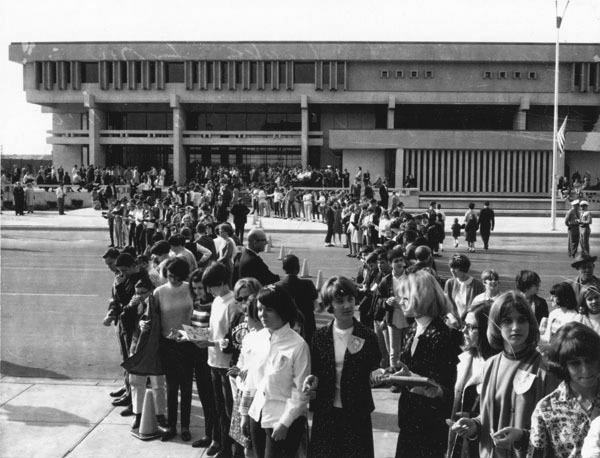 The new library is across the street from the old one, and opened March 13, 1967. Keywords: Libraries and museums, people, books.